DrumsOnTheWeb.com page... Drum Key - Manufacturers & Industry News - Brace Yourself - Tama Swingstar Pre-Packaged Kits Upgraded To New Double-Braced Hardware--with no price increase. 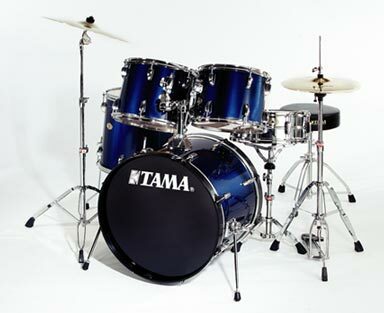 Tama Swingstar Pre-Packaged Kits Upgraded To New Double-Braced Hardware--with no price increase. Swingstar's Ready-To-Rock All-In-One Package To Upgrade To HT30 Double-Braced Throne--And No Price Increase! For the last several years, Tama's Swingstar line has seen seemingly constant upgrades. First the company radically upgraded Swingstar drums and hardware (only the shells remained untouched). Not long after, Tama made the whole line comprehensive with individually orderable drums instead of just offering a few "basic" 5-pc kits. Since no price increase accompanied the upgrades, most figured that Tama was finished for a time. But Tama still has a few more upgrades in its sleeve. As of the Summer 2002 NAMM Swingstar prepackage kits will come stock with doubled-braced hardware. Along the same lines, Swingstar's Ready-To-Rock all in one package which includes Planet Z cymbals by Zildjian will come with the new HT30 which also features double-braced legs. Swingstar drums feature 8-ply Philippine Mahogany shells. Available Swingstar Colors  BK Black, DFG Deep Forest Greeen, MNB Midnight Blue, NPL Night Purple, VTB Vintage Blue, VTR Vintage Red and VTS Vintage Silver.